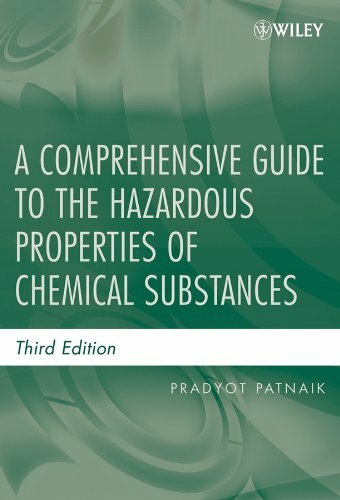 The definitive guide to the hazardous properties of chemical compounds Correlating chemical structure with toxicity to humans and the environment, and the chemical structure of compounds to their hazardous properties, A Comprehensive Guide to the Hazardous Properties of Chemical Substances, Third Edition allows users to assess the toxicity of a substance even when no experimental data exists. Thus, it bridges the gap between hazardous materials and chemistry. Extensively updated and expanded, this reference:* Examines organics, metals and inorganics, industrial solvents, common gases, particulates, explosives, and radioactive substances, covering everything from toxicity and carcinogenicity to flammability and explosive reactivity to handling and disposal practices * Arranges hazardous chemical substances according to their chemical structures and functional groups for easy reference* Includes updated information on the toxic, flammable, and explosive properties of chemical substances* Covers additional metals in the chapters on toxic and reactive metals* Updates the threshold exposure limits in the workplace air for a number of substances* Features the latest information on industrial solvents and toxic and flammable gases * Includes numerous tables, formulas, and a glossary for quick referenceBecause it provides information that enables those with a chemistry background to perform assessments without prior data, this comprehensive reference appeals to chemists, chemical engineers, toxicologists, and forensic scientists, as well as industrial hygienists, occupational physicians, Hazmat professionals, and others in related fields.